Like the nearby Coyote Buttes, Paria Rimrocks is a region of fantastic rock formations that was virtually unknown until a few years ago, becoming popular only by word of mouth and publication of a few photographs. The rimrocks cover a much smaller area than the buttes though they are not subject to any access restrictions and are also a lot easier to reach, being right next to US 89, a few miles east of the Paria River crossing and just within Grand Staircase-Escalante National Monument. Two small parking areas and BLM trail registers are all that identify the location, which extends between mileposts 19 and 21, on the north side of the road, shortly after it descends into a valley and curves round a small cliff (when approaching from the east) - see map below. 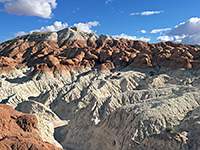 Vast areas either side of the Paria River have similar erosional scenery, based on bands of rock in many different colors - yellow, purple and red are the most prominent, though in the rimrocks, the layers are mostly white and red-brown, and the differing hardness of the strata have created a great expanse of cliffs, plateaus, canyons, washes and badlands. The one extra, more unusual feature of the rimrocks is the many balanced boulders, known variously as hoodoos, goblins, toadstools or mushrooms, where flat blocks of hard sandstone are perched atop narrow columns of softer rock, and these provide many of the most photogenic scenes. All the formations are composed of Entrada sandstone, specifically the red and white Gunsight Butte member, while the flat lands in front of the hoodoos are the top of the Carmel formation, and the highest layers of the cliffs behind are from the Dakota formation. The more popular east trailhead is about half way between mileposts 20 and 19, on the north side of the road; from the BLM trail register, a dusty, well trodden path winds along a dry wash for half a mile then climbs through some whitish badlands to a flat terrace, location of the main formations. These include the most photographed feature of the rimrocks, a shapely conical hoodoo at the edge of a ravine - known as ET, or the Red Toadstool. Tall grey cliffs rise to the north, and all around are other peaks and mounds showing abrupt color changes between white and reddish brown. 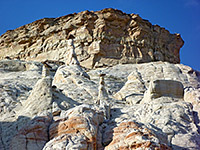 To the west, the land slopes up to an array of hoodoos, then falls away abruptly at the edge of the adjacent valley, while to the east, another plateau with isolated mushroom rocks is bordered by a low ridge, far side of which forms one wall of a white rock canyon that winds northeast for a mile and becomes quite narrow. Further away, the surrounding land has a mixture of small washes, mud hills, eroded pinnacles of many colors, all overlooked to the north by white cliffs of soft sandstone. Just above here runs the lower end of the long, unpaved road to Cottonwood Canyon. The rimrocks continue for another couple of miles westwards, bordering US 89, nearly as far as the wide valley of the Paria River. Access to the west part of the Paria Rimrocks is from the end of a very short track near milepost 21 of US 89, right opposite the road to the Paria Ranger Station. A path leads northwards close to a dry wash, up a wide valley between two mesas. Ahead are some interesting-looking red and white eroded formations, but the hoodoos are to the right, around the head of a side ravine - the route is up a ridge between some narrow gullies, to a sandy plateau at the foot of a line of cliffs. 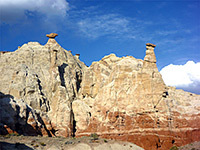 The hoodoos are higher still and rather inaccessible, 50 to 100 feet up a steep white hillside, and consist of brown caprock atop white pedestals, which merge with the slickrock of the cliffs. At the base of the cliffs is a thinner band of red boulders embedded in softer rock, while other features in the vicinity include a group of smooth, yellow-grey mounds and a number of short, twisting ravines, but overall the scenery is not so special, unless a route can be found to the hoodoo band above. Another option for reaching this area is to drive 3 miles along Cottonwood Canyon Road then head southwest for nearly a mile, to the brink of the cliffs.